If you are a waterfall lover like me, this is the best time of the year on the summit. With the snow melt at its peak for the next couple of weeks, the creekas are full and the falls are all flowing. One of the best waterfalls in the area, and the only one that is on the Royal Gorge lands acquired by the land trust and therefore publicly accessible, is Serena Creek Falls. This series of falls drops Serena Creek over 150 feet down the sheer cliffs of the Serena Creek Gorge as the water heads down to join up with the North Fork of the American River. Although they are only a little over a mile from Serene Lakes, the falls are not that well known except to some of the locals. Part of the reason is that getting to it is a bit of a walk because you have to descend 500 feet into the steep Serena Creek gorge. 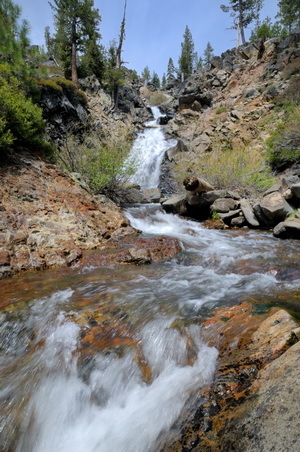 However, the walk is worth it to see one of the most spectacular waterfalls in the Donner Summit area. If you are interested in seeing this local wonder, consult my trail guide for the details. If you are a waterfall addict then you might want to also check out Palisade Falls.